Here’s a note & reminder that I’m Co-Hosting the 4th Annual Common Folk Awards on Tues, Dec. 6, 2011 (6-10pm ) at the Historic Gala Hispanic Theatre (Tivoli) in Wash, DC, along with my Co-Host, Mikuak Rai. 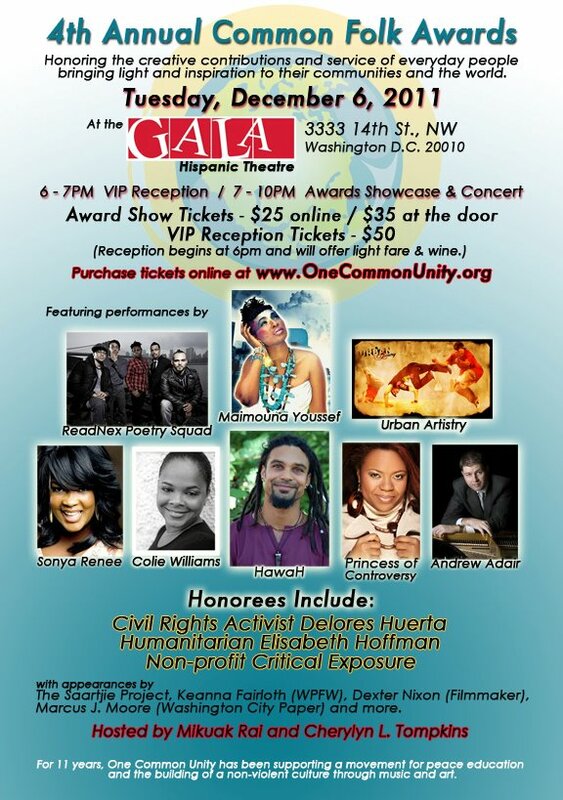 Proceeds from tickets sales for the VIP Reception & Awards Concert will benefit One Common Unity Organization (http://www.onecommonunity.org/). Full details written below (plus event flyers attached). There’s been an issue with receiving the discount code online. If you experienced this, just come to the event and pay at the door. Let them know you had an issue & the $15 ticket price will be honored!!! Yay!! Hope you can join us. Please share with others as well (especially if you live out of town … I included you because I know you know people in this area)!! We’re sure to have a Fabulous Night!! 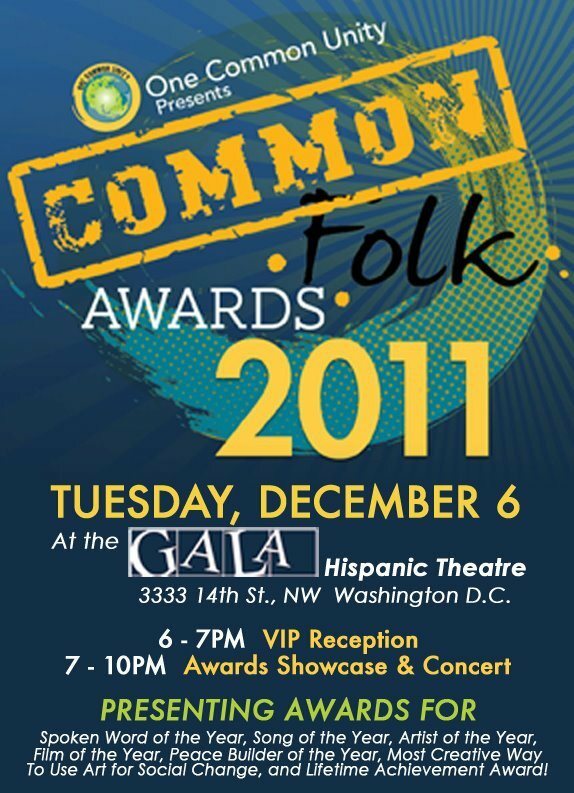 On Tuesday, December 6, 2011, at the historic Gala Theater in Washington DC, One Common Unity presents the 4th Annual Common Folk Awards showcase and concert; recognizing stories seldom heard, of those changing the world through peace education, arts, and media. The evening includes live performances from nationally recognized artists, poets, and musicians, as well as dynamic speakers and award presentations. Performers include: Aco-Yogis, Urban Artistry, Colie Williams, Princess of Controversy, Andrew Adair Trio, ReadNex Poetry Squad, Sonya Renee, HawaH Everlutionary, Maimouna Youssef and others. Special Appearances by The Saartjie Project, Keanna Fairloth (WPFW), Marcus J. Moore (Washington City Paper), & Dextor Nixon (Filmmaker). VIP Reception (6 – 7PM): Light fare & wine while mingling with local celebrities and change-makers begins at 6pm (official program commences at 7pm). Proceeds from ticket sales benefit One Common Unity. Event sponsors include Clif Bar, Flow Yoga Center, LiberatedMuse.com, Live Green, and more. Email us at onecommonunity@gmail.com for more information. As always, wishing you all and only the best.